Chinese migrated to Siam during the World War. They were not only landed in Thailand, but also brought their knowledge of making noodles with them. 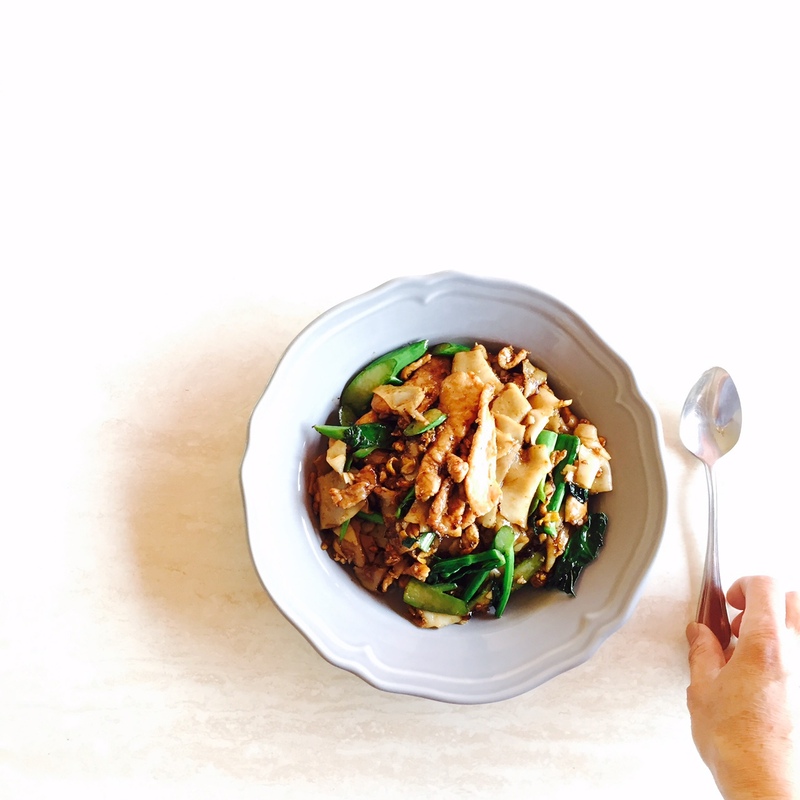 One of the very popular noodles, Kuay Teow- ก๋วยเตี๋ยว- flat rice noodle, was steamed in a bulky aluminium steamer making a thin layer of rice flour. Then vegetable oil will be rubbed on the thinly made film before another one stacking up. Layer after layer will make noodles. By the time using Kuay Teow, we have to cut and peel them into a long stripe one layer familiar looking noodle. In combination with Thai cooking techniques of browning garlic and seasonings, the Pad See Ew was born. Probably this is the best part of the wars that pushing Kuay Teow going across country to Thai deliciousness. Pour the olive oil into the pan, on high heat. Add 1 egg and scramble it. Add in the marinated pork, slightly stir. Add the chopped garlic and stir it up until turn yellow. Add oyster sauce, sugar, black soy sauce, and seasoning sauce. Stir up all ingredients lightly, cook until well done.